Fewer cranes on Seattle skyline for first time in years, but city still leads U.S.
Seattle’s crane counts fell significantly compared with the last count six months ago, even as all other cities tracked in a new report saw their crane totals grow slightly or remain the same. 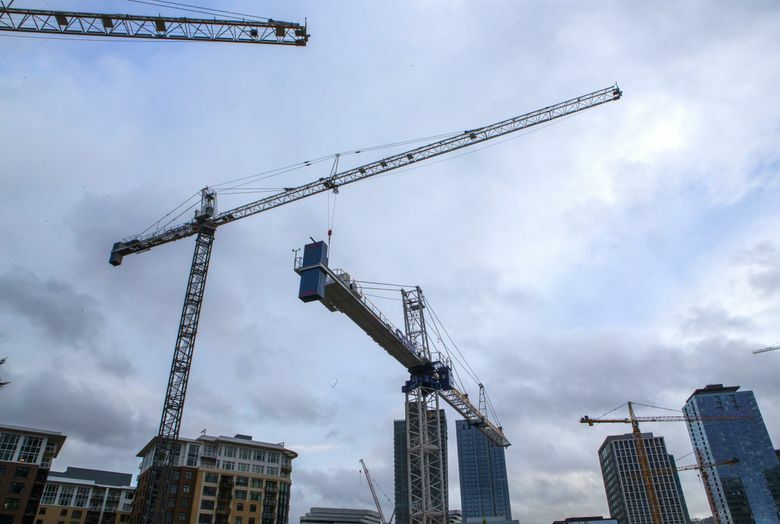 Seattle’s sky-high crane count has dropped significantly for the first time in years, suggesting the ongoing construction boom could be starting to lose some steam — even as the city continues to lead the country in total cranes. The city had 45 construction cranes transforming its skyline as of January, down 22 percent from the last tally six months ago, according to Rider Levett Bucknall, an international firm that counts cranes in big cities twice a year. 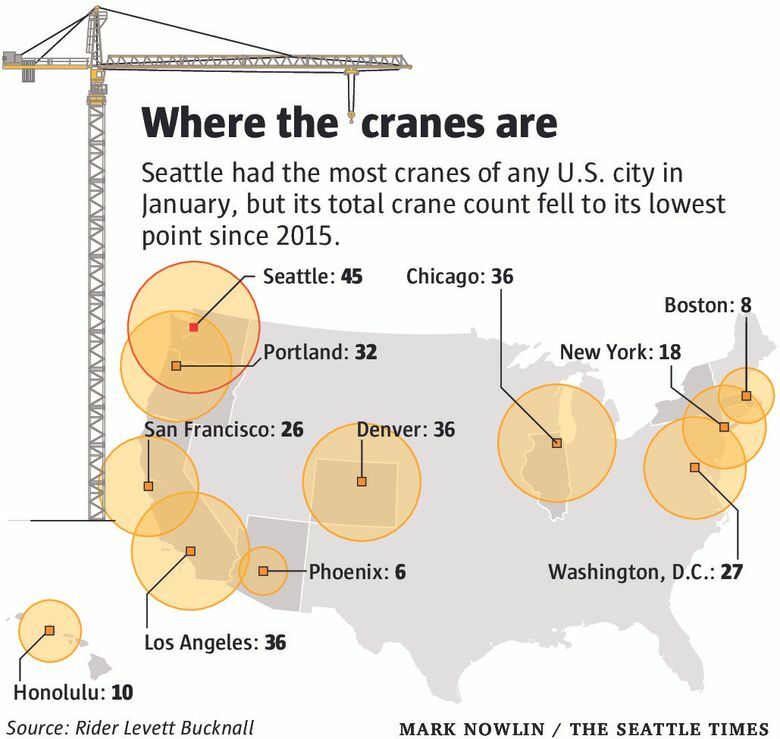 Seattle was the only big U.S. city to see its crane count drop in the latest survey. The city’s lead over others shrunk by half, with just nine cranes now separating it from three cities tied with the second-most cranes — Los Angeles, Denver and Chicago. Seattle first topped the nation in cranes in July 2016 and has kept the top spot in every count since. Before now, its totals hadn’t changed much over the last few years — hovering consistently around 60 cranes at any given time — but the latest count is the lowest since the city dropped to 42 cranes in July 2015. Often the first thing you see when enter Seattle, the tower cranes have come to symbolize a city that is rapidly transforming. And the semiannual crane counts have become a common theme for defining the city’s growth. The cranes can stretch 600 feet or more into the air and stay on job sites for two years at a time. Sometimes so many cranes pack into a project that they need to be set to different heights to avoid hitting each other. Developers need to reserve the equipment six months in advance — and crane operators have been hard to come by. Despite the recent decline, “the city’s construction market remains healthy,” Rider Levett Bucknall said. The firm notes that while several high-rises underway over the last few years have now finished, plenty of new ones have popped up to take their place. It forecasts another busy year for 2018. The report says cranes are especially active in South Lake Union — driven by Amazon’s growth, along with a new, three-crane Google office project that Vulcan began developing last year. Other hot spots include the nearby Denny Triangle, Capitol Hill and the University District, while there are also cranes in neighborhoods such as Ballard and West Seattle. Most of the new buildings under construction are apartments. A flood of new rental high-rises hitting the market late last year led to the first significant rent drop in Seattle this decade, with 6 percent declines downtown, where the bulk of the new towers are. The apartment frenzy could be slowing, though. Developers have noted that banks have started to pull back on funding new apartment towers as rents have begun to lag behind rising construction costs. The city also added 3.3 million square feet of office space in 2017, easily the most in the past 12 years and about double the long-term average, according to the Broderick Group. But that sector may have peaked too: The brokerage estimates office development to taper off, with about 1.8 million square feet per year in the pipeline for the rest of the decade. Lori Mason Curran, real-estate investment strategy director for Vulcan, said that while construction continues “full steam ahead,” there might be fewer projects that get underway in 2018 than in previous years. There will likely be fewer office buildings built without a tenant already lined up, for instance, she said. The notable projects to have taken their cranes down recently include the F5 Tower downtown, now the fifth-biggest skyscraper in the city and the future headquarters for the Seattle tech company of the same name. The most significant to begin construction recently is Rainier Square, a future Amazon office that will be the city’s second-tallest tower, at 58 stories. Outside of the city, there are a few scattered cranes across the suburbs that aren’t included in the Rider Levett Bucknall count. Bellevue now has seven cranes, up from four last summer, city officials said. 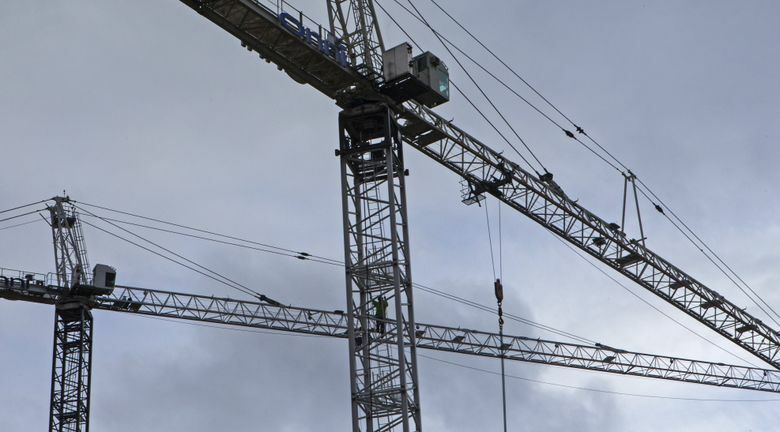 While Seattle’s crane count dropped, every other city on the list saw its crane totals either grow slightly or remain steady from the last update six months ago. Los Angeles was again second in the country with 36 cranes, unchanged from last summer. But it’s now joined by Denver and Chicago, which both saw a small uptick in cranes. Portland remained No. 5 on the list with 32 cranes, the same as six months prior. Seattle still has more cranes than New York and San Francisco combined. But it remains well behind Toronto, which has 88, for the most in North America. Several other international cities from Australia to the Middle East have more than Seattle, as well.